Woodland owners in the Pacific Northwest are interested in maintaining forests that provide a broad range of ecological functions and economic goals. Enjoying wildlife and providing wildlife habitat are often motivators for stewarding woodlands. It’s important to understand how the habitat in your forest meets the needs of particular wildlife species and what you can do to maintain and enhance your forest for biodiversity. 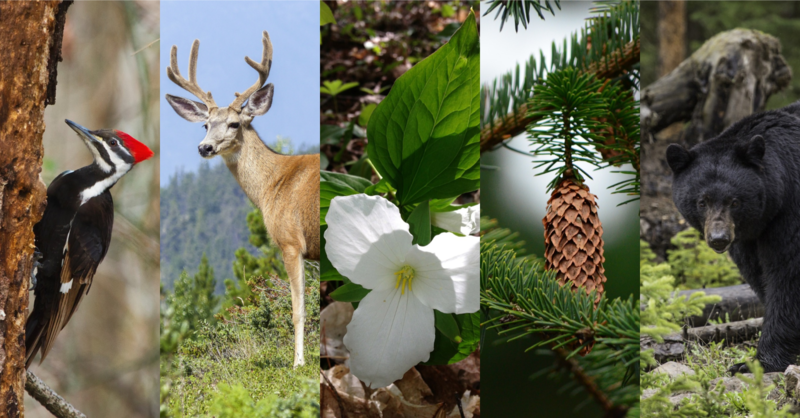 Many Northwest forests are in need of active forest management to create the complex forest structure, light for flowering plants, and space for food-producing shrubs that help wildlife thrive. Careful stewardship can help you to perpetually manage your forest on a regenerative cycle. One that allows for multiple entries and a sustained yield of a broad range of high-value forest products. The timing and design of thinning practices can result in a wide variety of forest conditions depending on the landowners’ objectives—including those that benefit wildlife habitat, forest health, and long-term income generation. This workshop will introduce you to the principles of ecological forestry, tools to implement it successfully on smaller parcels, and the structural and biotic features of forests that help wildlife thrive. Come learn about forest growth, harvest strategies, and steps you can take to enhance wildlife habitat on your land. We are offering this workshop in both Northwest Oregon and Southwest Washington. Please feel free to choose the most convenient date and location! Note, we will emphasize the local programs and resources at each state-specific event. All woodland owners are encouraged to attend! In the morning, speakers will include: Glenn Ahrens, forester and researcher for Oregon State University Extension in Clackamas, Hood River and Marion Counties; Lori Hennings, senior natural resource scientist for Metro; Michael Ahr, forest conservationist for West Multnomah Soil & Water Conservation District; and Jeanie Taylor, owner of Gopher Valley Forest. In the afternoon, Mike Crabtree will lead a tour of Miller Woods, Yamhill Soil & Water Conservation District’s 130-acre forest and natural area that underwent a harvest treatment in 2015 to enhance forest health by removing lower quality trees and thinning the stands to create proper spacing that will promote healthy tree growth. Participants will learn how they can manage their own projects that can provide periodic income, improve forest structure, and enhance wildlife habitat. SOLD OUT! Please consider attending the Oregon workshop (above) or email us at outreach@nnrg.org to be placed on the Washington workshop’s waitlist. In the morning, speakers will include: Rolf Gersonde, silviculturist and researcher for the City of Seattle’s Cedar River Watershed; Ken Bevis, landowner assistance fish and wildlife biologist for the Department of Natural Resources; and Dave Houk, service forester for Grays Harbor Conservation District. In the afternoon, John Henrikson will lead a tour of the forest at Wild Thyme Farm and show his recent harvest projects. Wild Thyme Farm entails an ever evolving demonstration of permaculture, wild food harvest and ecological forestry. Participants will learn how they can manage their own projects that can provide periodic income, improve forest structure, and enhance wildlife habitat.